Instagram was launched in 2010, and the growth of this new social networking site has been amazing. The platform went from 1 million users during the first two months on the market to over 800 million users by September 2017. According to Business of Apps, as a brand, Instagram is increasingly the most successful of all of the other major social platforms. We know that instagram is used by young people and adults alike, but how are businesses using it to successfully market themselves? Considering that the average user follows between 400-500 accounts and 95 million photos and videos are uploaded and shared daily, that is a lot of content for users to look through everyday. We get this question a lot when helping advisors with their social media strategies – what about Instagram? Should I be on that platform as well? According to recent Sprout Social statistics, an estimated 71% of US businesses use instagram. Additionally, small businesses currently make up the majority of Instagram advertisers and business profiles. When it comes to instagram in the financial sector, it becomes a handy tool for firms to really show (not tell) how relatable they are and gives them much more flexibility in their storytelling. We understand that adding yet another social media platform to the mix can be a headache but even more importantly – what’s the return on investment and how can the potential of it be maximized? Today we’re covering six tips on how you can best use Instagram for your financial planning firm. Images do a much better job of telling a story than just writing about it. Rather than saying your employees participated in a volunteer effort, you can show a picture of them doing this activity along with a small caption. The below is an Instagram example from Twenty Over Ten client, Financial Strategies Group. Their employee is pictured dropping off supplies to Child and Family Charities. This is a fun and easy way to showcase the great things that their firm is doing as a way of giving back to the community. Using hashtags on any social media platform essentially help users find what they’re searching for. Same is true on Instagram, so tagging your pictures appropriately allows for your company to become a part of the larger conversation. Use hashtags that make sense for your company and make sure that they are specific so they don’t get lost among the other thousands of tags. Don’t be afraid to get funny and witty with your hashtags, they don’t always have to be serious or work-related. Using at least 5-7 hashtags is typically a good rule of thumb. Doing so will allow for your image or images to be shown more often, which will in turn, could potentially generate more followers. 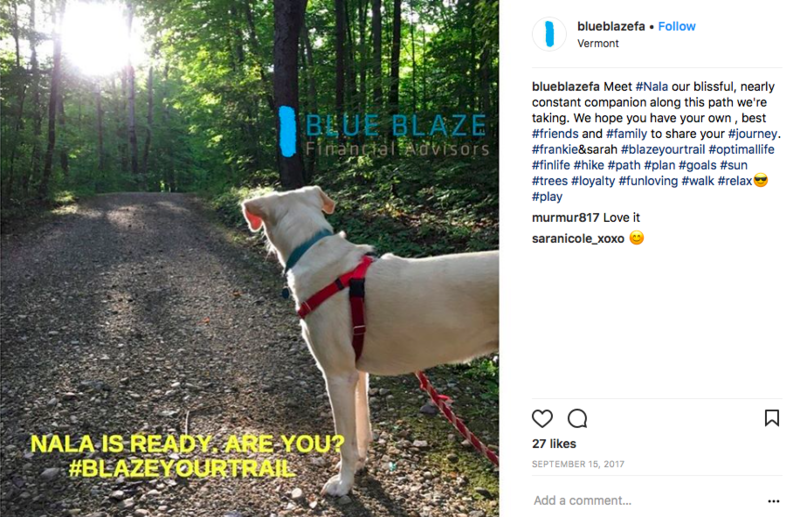 When it comes to hashtags, Blue Blaze Financial Advisors, does a great job of incorporating hashtags into their posts to make their content more visible. They’ve even created the branded hashtag #blazeyourtrail, which they use in several of their Instagram posts. This works well for them when speaking about the outdoors but has also become a slogan for their company, as they leverage hiking references throughout all their marketing efforts. Instagram contests are widely popular and hosting one is a fun way to engage your followers and possibly even acquire new followers. Running contests is another way for your firm to get more involved with your followers on Instagram and interactive participation is a great way to show that there is a “real person” behind the account who wants to connect with others. It’s important for companies to be involved in charitable services, to give back to the community and show how much they are invested in helping others in their local community. Instagram is a great platform to share moments like this that show the ways in which your employees are making your community a better place for everyone. 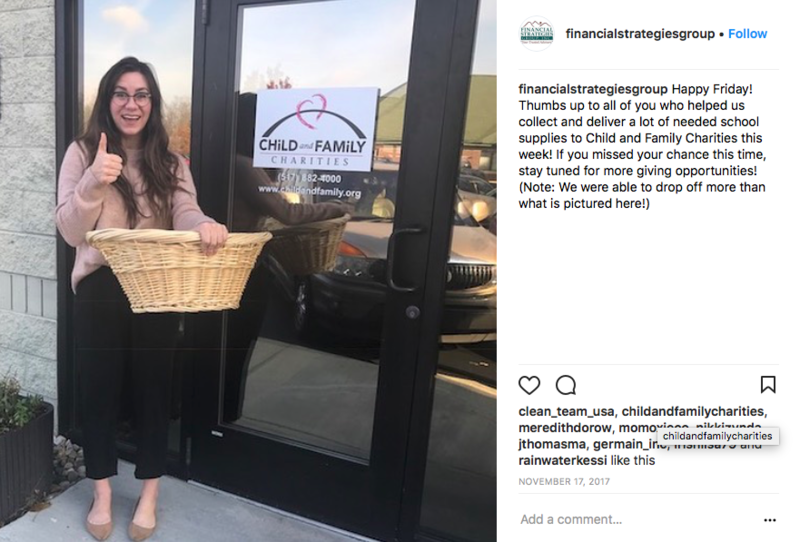 Financial Strategies Group does a great job of posting pictures of their employees becoming involved in charities and supporting good causes. 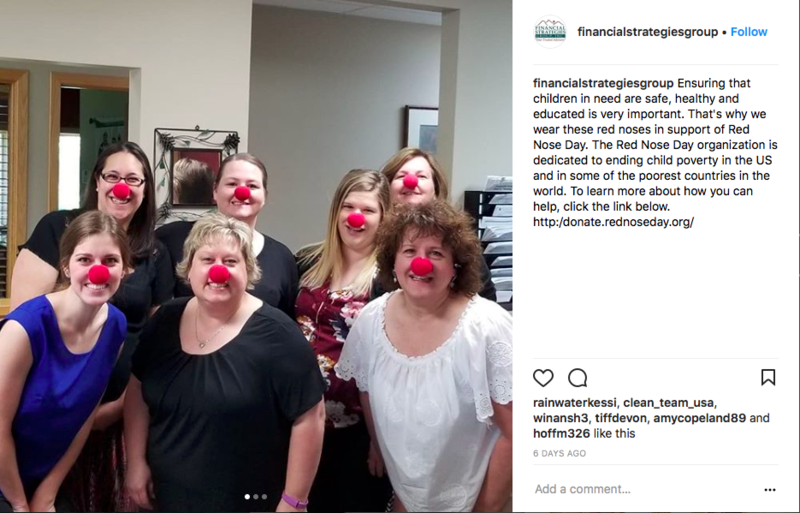 In the example below, their team participated in the Red Nose Day initiative posting a picture of their team with red noses and encouraged followers to donate to the cause for childhood poverty. It is important to support local businesses that are also on Instagram. Your firm does not want to come off as “stuffy,” so it is a good idea to engage with others as being deeply rooted in your local community can often be a large part of a firm’s brand strategy. For example, maybe there’s a local coffee or donut shop nearby that your office gets weekly treats from for the office. Consider following them on Instagram, posting a picture of your bounty, and tagging them. You never know – they may return the favor one day! Lastly, it’s always a good idea to link your company’s Instagram account with your other social channels, as this is a great way to boost engagement across all of the channels with one post. It will also make your life a lot easier. Don’t forget to also include an instagram icon on your website that links out to your profile to your website visitors can easily access your profile.